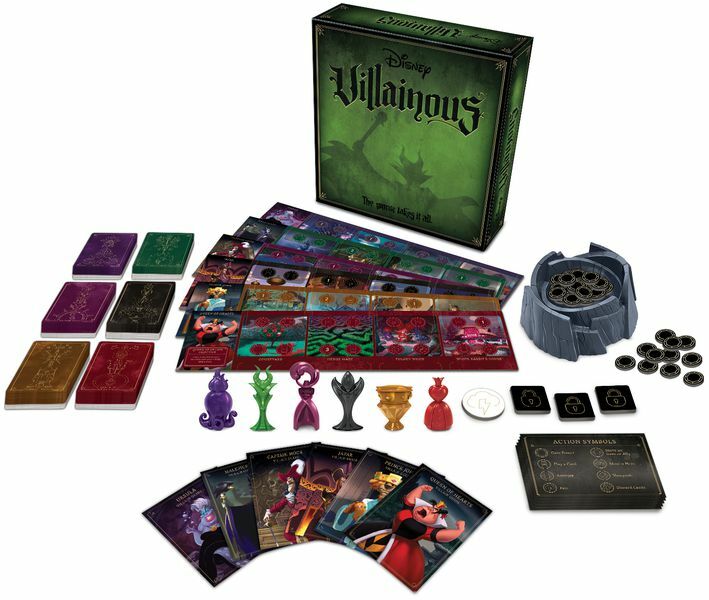 Villainous was one of the more hotly anticipated GenCon 2018 releases. There has been a lot of buzz about the game as it is a mass market release that has the Disney license. 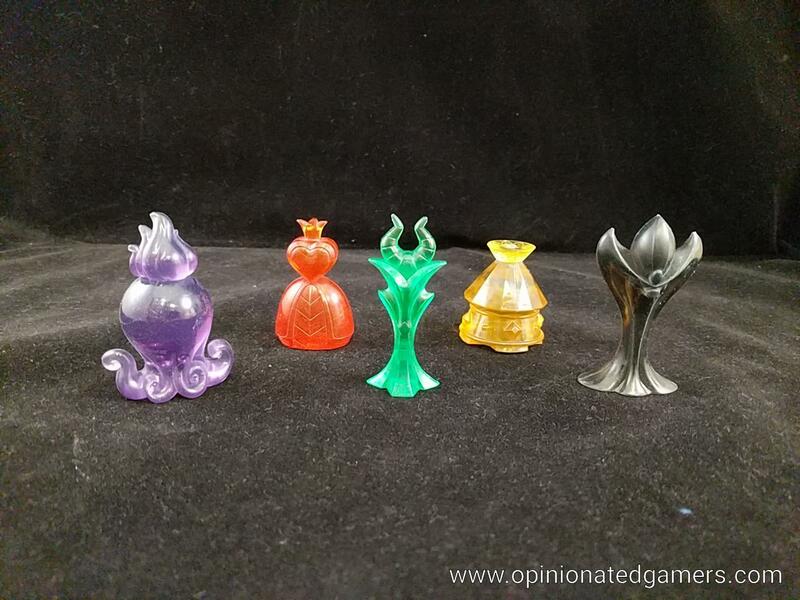 And, in something which is unique (at least in the board game sense), this is the first boardgame that I can remember which has characters from multiple movies – something seen in Kingdom Hearts and Disney Heroes in the videogame world. 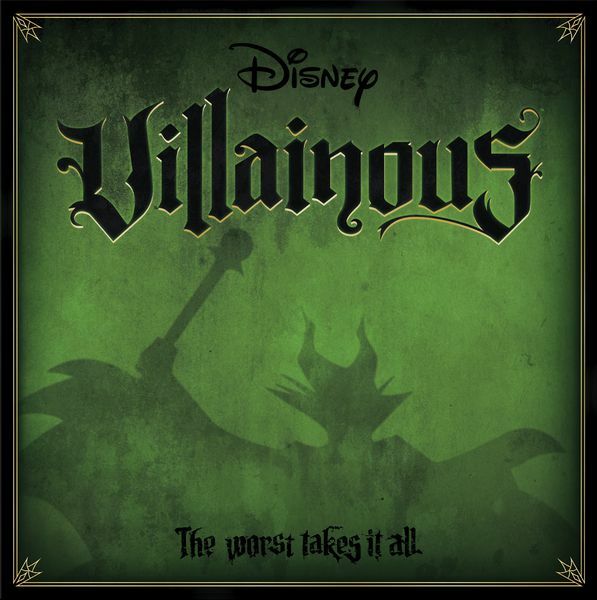 In Villainous, each player takes on the role of a Disney Villain: Captain Hook, Jafar, Maleficent, Prince John, the Queen of Hearts or Ursula. Each villain has their own board and deck of cards. The goal of each player is to be the first to achieve their unique victory condition. The game ends immediately when this occurs. 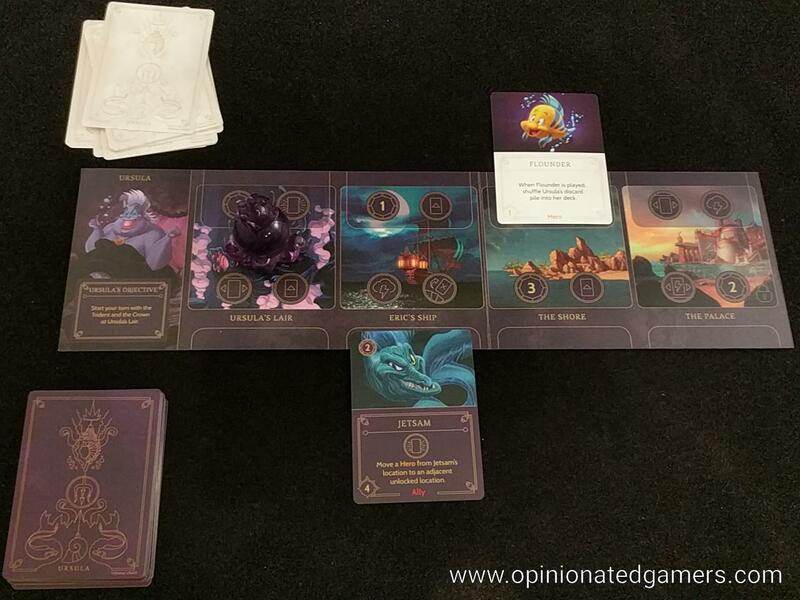 To start, each player chooses their villain, and takes the matching board, deck of cards and strategy guide. The board is placed on the table in front of them, leaving space for cards to be played both above and below the board. The deck of cards is split into its two types of cards – the colored villain deck shuffled and placed to the left of the board, the white Fate deck shuffled and placed to the right. The acrylic player mover is put on the leftmost location space of the board. 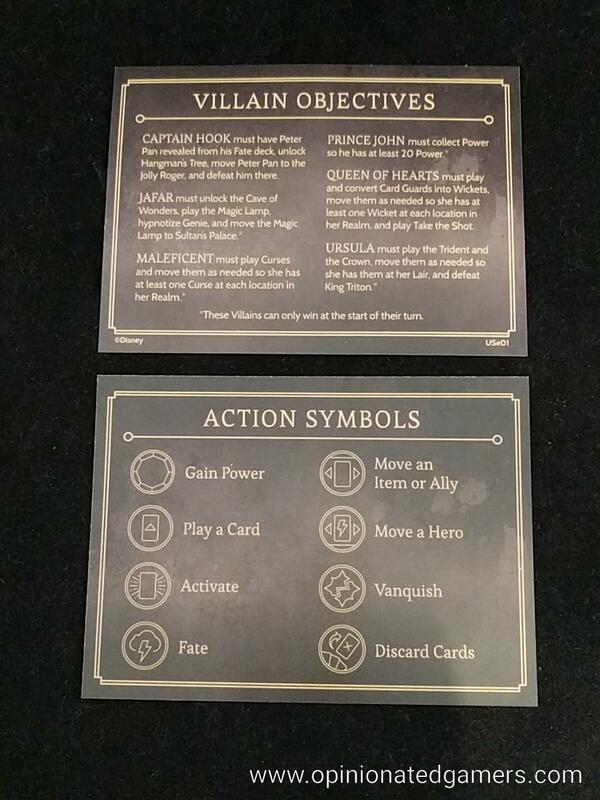 Each player gets a hand of four cards from their Villain deck, and players get a starting supply of Fate tokens. Players then take turns to go through their three phase turn. First, the active player must move their character to a new location on their board. Movers (and cards) will never leave the area associated with that character! Some of the boards start the game with a lock token on them – the player may not move into that area until the lock token has been removed. Play a card – play a Villain card from your hand. Pay a number of power chips as seen in the upper left of the card. Villain cards are always played to the bottom of your board. Fate – choose any of your opponents and draw 2 cards from their Fate deck. You may play the card of your choice by placing it on the top of their board – this may cover some of the action icons in that opponent’s space, and your opponent cannot take those actions until the Fate card is removed. Many of these cards are Hero cards which are specific to your villain. Vanquish – defeat a Hero by using Ally or Allies that are present at the same location. The total strength of the Ally cards at least equal to the strength of the Hero. The Hero and Allies are each placed in their respective discard piles. Third, you draw cards from your Villain deck to bring your hand back up to four cards. If your Villain deck is exhausted, shuffle your discard pile and draw from the new deck. Play then rotates to the next player UNLESS the active player has met their victory condition… if so, the game immediately ends. When I first heard about the game, I was interested to see how an advanced strategy game would be presented to the mass market consumer. For many, the theme alone makes the game a must-buy. I, however, am not overcome with the Mouse sickness, so the Disney bit wouldn’t sway me too much. It was pretty obvious to me that I was not the target market for this particular game, and after playing a few times, I can see the promise of the game while recognizing that it’s not a game meant for me. The complexity of the game is surprisingly high for something which is meant to be sold at an American big box store. 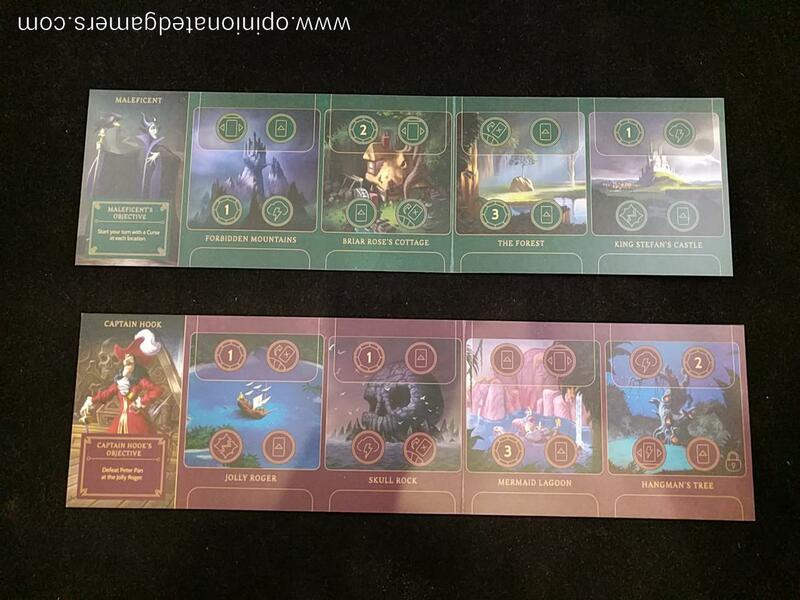 Players will have to navigate a deck of 30 Villain cards with casting costs, some activation costs, and some conditional actions. As you can see from the win conditions listed above, it is not particularly straightforward to see how some of the Villains will win the game. To that end, the game includes strategy guides for each of the villains which explain any unique setup concepts, explain the Villain’s goal as well as instructions on how to achieve the win condition. The back side of the guide also has other strategy hints for that particular character. While I think that this sort of thing is nice for a novice gamer, and likely absolutely essential for people who have not played strategy games – I really balk at games which essentially tell you how to play. As a gamer, I want to discover the strategies and card interactions on my own. As far as the strategies go, I do like the fact that each of the six villains needs to be played differently. 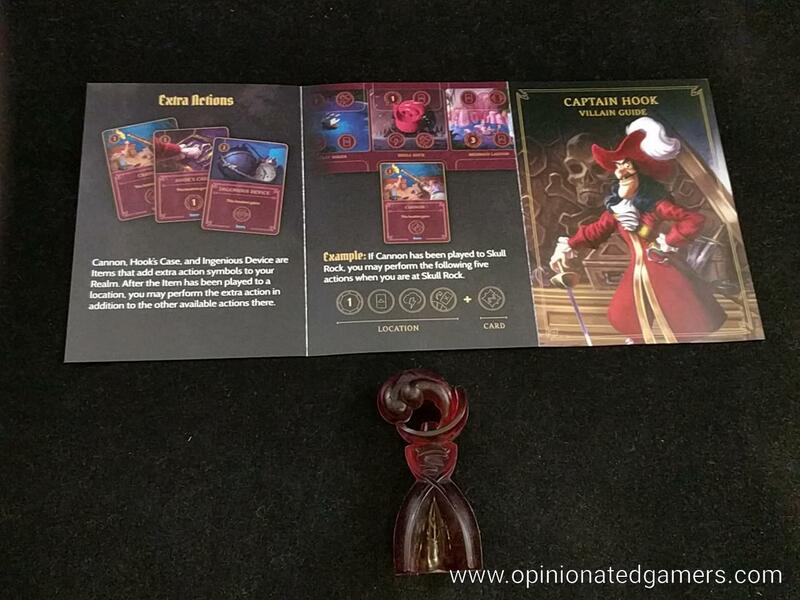 However, in two of my four games, I have been randomly assigned Villains (Captain Hook, Ursula) which were frustrating to play (for me) because you essentially have to deck dive to get the right card to play in order to win. Let me tell you, nothing makes me feel like I have enacted a great strategic plan other than knowing that I was super lucky in drawing the one card I needed out of the entire deck early on in the game… Go me! I also had a frustrating game where an opponent had the right card in his hand on his initial deal, and that made his that much closer to the win. This high level of variance might be OK except that some of the other villains have a fixed path which cannot be altered. The mechanism in the game which balances this out is the targeted nature of the Fate cards. If one player is felt to be close to winning, the other players will end up ganging up on that player and playing Fate cards to his board – thus reducing the number of actions that can be taken each turn. While this mechanic works in practice, the idea of targeted attacks is one that I have never been in favor of. There is nothing more frustrating than being the target of a dogpile of attacks, and it’s generally the sort of thing that causes me to stay away from a game. Many of my issues are mitigated by reducing the player count to 2. At this number, there is very little downtime and there is essentially no targeted attacks because your opponent always plays against you and vice versa. I enjoyed the game I played with 2 players, and would certainly be willing to play the game again at that player count – but at this time, I don’t think there is a chance that I’d ever play with more than 2. The balance between the decks is not great, and I don’t want anyone having a miserable gaming experience – and I think that chance of that is high. Though, if the need for a 6p Disney game ever comes up, I think I have an alternate strategy that will work better. I can still teach the game to everyone at once, but then I think I would demand that the game be played in three 1v1 matchups (essentially, 3 two-player games all played at the same time). There will be much less downtime, and the targeting issue is moot in a 2p game. The art in the game is nice, and as this is an officially licensed game, actual art from the movies is used in the game. During one of my games, one of the other players had a Disney playlist that we listened to as we played, and that added an extra dimension of theme to the experience. In the end, this is a tough game to rate for review. I like the game for 2 players, and I think it is a good game that can be used to introduce newbies to more advanced strategy games. In either of those conditions, I would recommend this game for purchase. It would also be good as a gift in that regard. That being said, my issues with the game are inherent to the game, and there’s not a lot that can be done to change them, and it’s not the sort of game that I would want to play again. I think this mostly comes down to the fact that I don’t think that I’m the target audience for this game as I am fully aware that there is an entire hobby of games that are better suited to my tastes. But, for people who don’t know that, this would be an excellent introduction to games that are more than roll and move – especially with the Disney tie-in which will attract an additional subset of people who may not be otherwise interested in games. Steph Hodge Very cool concept, but not exciting. Wanted something more and in general just boring. James Nathan (1 play, 5 players): Dale’s thoughts represent most of what I have to say. I generally have a strong distaste for “big stack of cards” games where I feel that a certain amount of deck-diving is required, and in my one play, it was required at least twice, and I think three times – as after I found one card, I needed a second specific card. Many of my turns were simply shed as many cards as I could so that I could draw more, and often this meant discarding as the conditions for playing the cards wasn’t applicable. There was one interesting choice around how many cards to discard, as perhaps I should save something for contingency purposes, and is it worth the slower sifting? For me, I wonder how the game could’ve been received if a simultaneous-play method could have been developed. Outside of the occasional fate card, there’s no interaction other than the race-to-victory-condition, and perhaps this would’ve shrunk the downtime in such a way that it would’ve been easier to, or there would be cause to, forgive its other sins.